We doubled our hoofprints Wednesday. 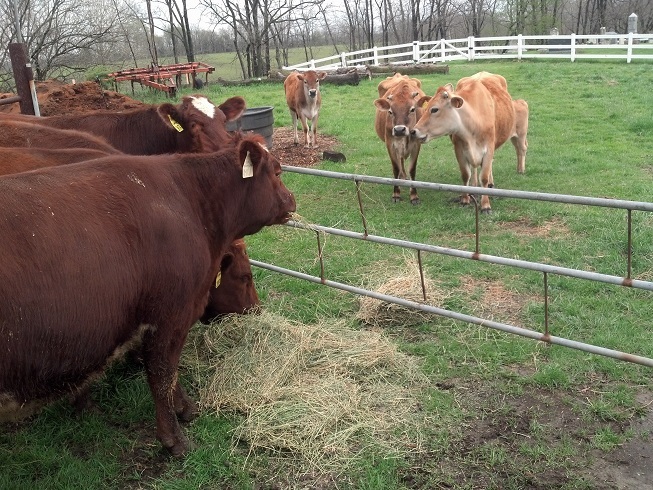 We started with two Jersey heifers and their calves and added four Shorthorn heifers. And it looks like we’re going to go ahead and pick up a couple more. (Update two days later: now 6 shorthorns.) All registered. All fat. Each weighing more than any two of my little Jerseys combined. Ugh. These girls know how to eat. Our Jerseys will look right past second cutting alfalfa. The Shorthorns licked it right up. It was pretty amazing. 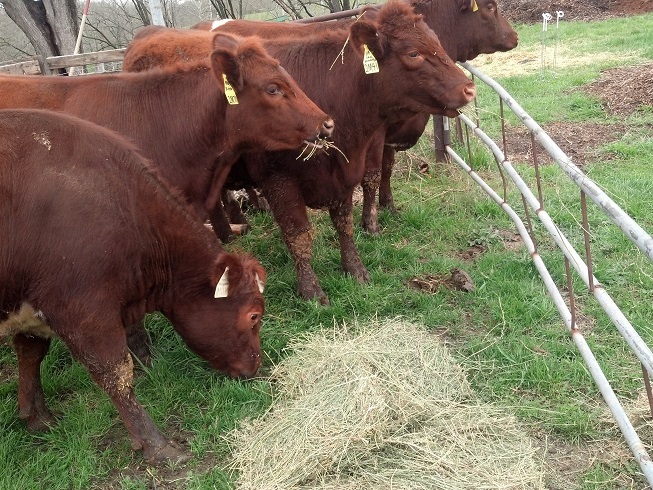 Once they were full of hay we opened up a new strip of pasture and turned the girls out with the Jerseys. I have to say, I was a little nervous. 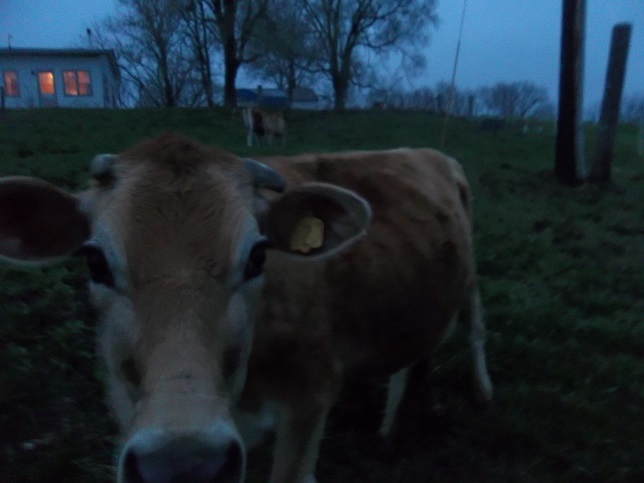 Each of the heifers had a strongly negative experience with our electric fence before we turned them out and had been in electric fence previously but…still nervous. So far so good. Needless to say they went right to work eating everything in sight. It was late afternoon before we put them out and their bellies were full of hay so I had little fear of bloat. Everybody seemed to get along. I only had to stop them from pacing the fence once. Just me in a lawn chair with a camera. They seem gentle. Not pets but they don’t mind me being in the same zip code with them. Big bellies, big butts, short legs. They will mature a little on the heavy side for our ideal and they aren’t specifically bred for performance on fescue but…good looking cows. So. Now we’re hanging on for dear life. Rolling through spring pasture. Huge, heavy hoofprints pushing organic material deep into the pastures. Pretty cool. I need them to really abuse a section of pasture or two but I have to be careful not to stress them. They’ve been on a hot feed in a feedlot for the past few months. Grass-only is quite the change. Further, we’re having trouble keeping May (the skinny Jersey) in condition. She’s doing better right now but she’s not as much of an agressive eater as the other 7 cows. Wish us luck and feel free to offer advice. Saturday was beautiful. We worked at a leisurely pace and wrapped up processing and packing birds in about 3 hours of work time then went to church in the evening. No big deal. Sunday was awful. Awful. The wind picked up and I felt like I was fighting the scalder all day long. Just awful. As a quick review, we really like our Featherman equipment but you have to know its limitations. The Featherman kill cones are awesome. We find cleanup is easier if we fill the base with sawdust before we begin but the cones themselves owe me nothing. The plucker may be the best thing ever. Compared to the Whizbang we used before, the Featherman plucker is a dream. Where before the birds would tear, legs would get stuck or the belt would fall off, with this beauty there is no belt, the fingers are very soft and we have never had a leg (or head) fall through. On top of that I suspect, were one so inclined, the plucker would work on the moon. Really. But now the fun part. I’ll start by saying in the old days we used a pot on a turkey fryer in conjunction with a number of pots warming water on an electric stove. It was awful. I was married to the scalder, holding two birds at a time in the water, hoping I was keeping the water at a consistent temperature and trying not to splash water into the burner. Please understand, your whole processing experience hinges on getting a good scald. If your scald is poor, your day will be long. You will pick feathers all the way through to packaging…slowing that process down too. So we got the Featherman one. Bigger burner, larger thermal mass, automatic dunker. Should be awesome right? Well…it is. But only under fair conditions. You can’t expect a miracle. If you are working outside in a 20 mph wind on a 30 degree morning you should hold off for better weather. That was reinforced for us yesterday. The first 10 or 12 birds were great. From then on it was all downhill. At 30 we decided to call it and go eat an early lunch as the propane tank had frozen. The kids and I even fit in some goof-off time. I fell asleep playing video games with them. The kids thought it was hilarious. By 1:00 the air temperature had risen enough that the scalder was back on top of its game…but out of propane. I changed tanks, heated some water on the stove to kickstart the process and we dove into the work. We worked at a slow pace as we were tired from processing the day before and finished up 115 birds by 3. Work with the weather. If it’s cold and windy either move indoors or wait until it is not cold and windy. Similarly, if you want to play baseball at night, turn on bright lights or hold off till daytime. I don’t know why this is so hard for me to remember. If the birds dress out above 4 pounds each you can only put one bird in each basket. Smaller birds can double up. The roto-dunker motor can only do so much lifting. Refill the water frequently. Keep it full. Refill with warm water if available to keep the burner from working so hard. There is an overflow location on your scalder. Plug it. Be sure your scalder is parked level. Even 1/4″ out of level and you risk the birds falling out. Sharp knives. If your knives are razor sharp you do less cutting or sawing. Less work means less tired. Less tired is more good. Keep a bucket of water near kill station to clean your kill knife(-ves). I now keep a gallon bucket of warm, soapy water on top of the kill station and drop my knife in every kill. It is just more pleasant to use a knife that isn’t coated in dried blood. Be careful what you sell. Years ago we offered a group of Asian customers more than we could deliver at a profit. We offered chicken with feet and head still attached. They loved it but the bird didn’t fit in a gallon Ziploc bag. Again, it sold well but was inconvenient for us. Sometimes customers ask for heads or feet or gizzards. It would be nice to sell every part of the bird but there are no free lunches. At some point we have to say no. Don’t use gallon Ziploc bags. Say no. Yeah, I know. Look. Pencil it out. It may sound like a great idea but every new idea takes more time. And more energy. And more packaging. I have better things to do with my time than split gizzards. Maybe when the kids are older. If you are going to cut up a bird make sure you are getting paid to do so. The total of the bird cut into parts should be greater than the price of the bird intact. If it’s not, either raise your prices or stop wasting your time. Dumb, dumb, dumb. Give yourself enough time. We can kill 100 birds in about the same time it takes us to clean up from killing any number of birds. Clean up takes longer than you expect. Plan for it. After we clean up we shower, change and begin packaging the birds. Again, this can take more time than you expect at a time when you are already tired. Plan to rest. Chicken processing is intense, hard, heavy work. I kill, scald and pluck. That means I pick up each 7 pound bird when I pack it in a crate, load it into a cone, place it in the scalder, move it to the plucker and carry it to foot removal and final picking. Along the way I pull the head. Let’ me tell you, I’m sore the next day. Plan to rest. We (I) have made (make) a lot of stupid decisions…usually based on emotion. Fear can keep you in bed. Carelessness can cause major injury. Short tempers can damage your relationship with your children…er…co-workers. Raising chickens can make you swear off raising chickens. But fear is paralyzing. Fear is the mind killer. Fear is the little death that brings total obliteration. Confront your fears. Chicks will die for no apparent reason. Chickens may not always die quickly. A dying chicken will fling poop in your face. You will cut your finger. Some customers may complain about your prices. Freezers full of meat may thaw. You may lose money. Your family may say, “I told you so”. Once those fears are counted and compelled, they can quickly be dispelled. Don’t be afraid. Let me know if you have any additional tips for butchering day. It’s hard work but little changes to the routine can make it better. It seems to get better for us each year, beyond the kids growing up and becoming more helpful. The cows are busy bulldozing the ground the pigs recently worked. This is a south-facing slope. The fescue has recovered to 10 or 12 inches and the cows really seem to like it. We are grazing the fescue pretty hard right now hoping to knock it back and make room for better grasses and an array of clovers. The cows are taking quite a bit of the grass. Normally we try to graze the top third of the plant but right now we are letting them take more. Some of that is our ability to read the pasture, some of it is experience, some of it is intentional. 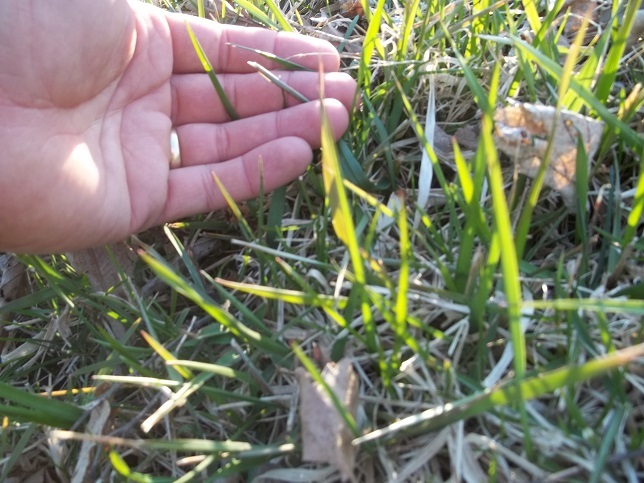 Early spring weather and fescue are both forgiving. I am surprised how much fescue the cows are eating. I am also surprised how much kelp they are eating. I suppose they are using the kelp for a source of magnesium and the fescue toxicity is low in the cool weather. The cows are hard at work but really prefer to graze in the later hours of the day. We still feed hay in the morning and Julie is milking once/day every other day, letting the calves take the rest. The ground is soft from pigs and rain and there is a hoof print at least every square foot and a manure pat every square yard. I have high hopes for this slope as it recovers. The cows get a series of 20×20 areas throughout the day, anything they grazed 4 days ago gets fenced out. They have room to move around, find a place to lay down and always fresh grazing. 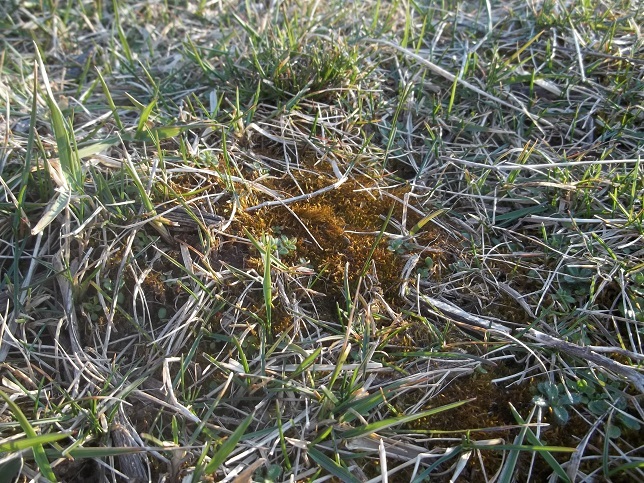 The 4-day old grazing needs to be protected as it is beginning to recover. The cows are regaining condition quickly. They had about 3 weeks on the eastern face of this hill ending with the top of the hill. That was largely a stand of henbit, chickweed, fodder oats, fescue and a mix of clovers. That hill will now rest for at least 45 days before the cows see it again. Later in the summer it will be more like a 90 day rest period. I look forward to grazing this again in June…before it gets too hot as there is little shade on the slope. Good night cows. We have nearly 3″ of rain in the forecast for the next 30 hours. I’ll do my best to keep your hooves on fresh ground and your bellies full. After this hill we’ll take the cows back over West of the cemetery and work our way to the West. Hopefully when we get there they will be joined by some new friends. More on that another time. Sorry the pictures are dark. I had to take pictures after chores were finished…after I got off work. Lots to do getting ready for the next round of monsoon. So. How does this work in the morning? 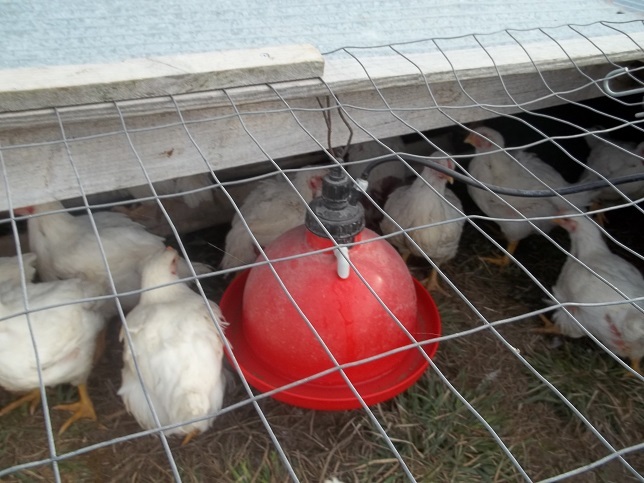 What do you do with your chickens each day? I’m glad you asked. Have you seen the Walmart cheer? We don’t do that. We walk or bike down to the alfalfa field (half mile?) and are greeted by the entire flock. Then there are a couple of checks we do every time. 1. Are any layers dead? It happens. Something penetrates our fence, enduring the pain of electrocution in desperation for a free chicken dinner. Or it flies in. Whichever. But it happens rarely but sometimes birds die. 2. Do they have water? 3. Do they have feed? 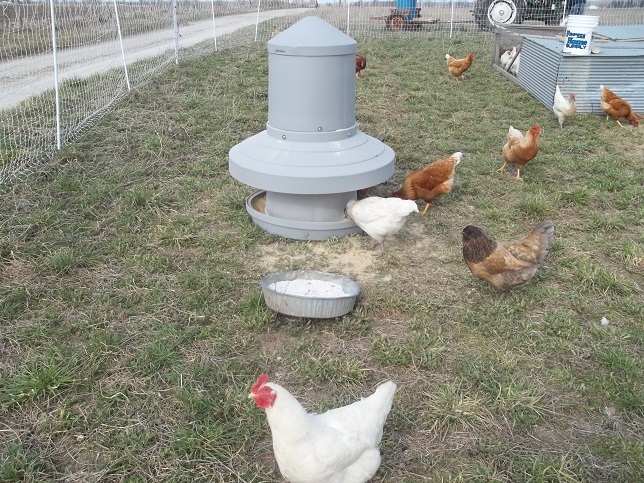 We now keep a 300# pasture feeder in the field. We only feed the birds once each week. It’s great. 4. Do they have shell? No shell means broken eggs. Then we check the chicken tractors. 2. Do they have water? Do the birds have access to that water? 3. 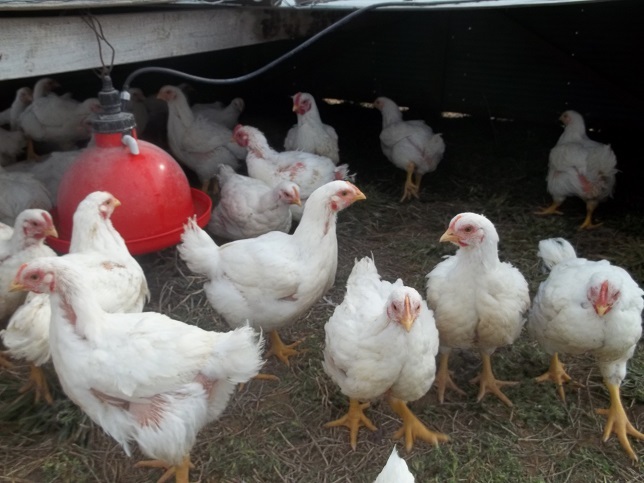 Are any broilers dead? It’s rare but it does happen. Most commonly happens when they are very young and pile on top of each other. It can happen when they get just about butcher weight. But it can also happen after a heavy rainstorm. You will know because the birds will probably be laying on their face. 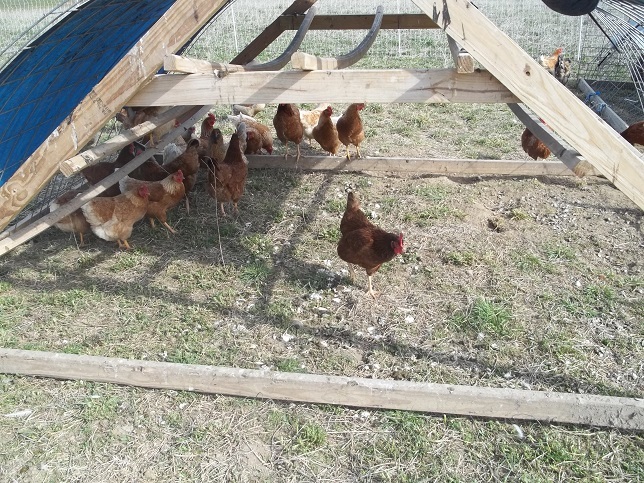 We have only had two deaths in a chicken tractor related to predation. One morning we found two dead chickens in the same tractor. They were young birds. One was killed by talons of a predator through the chicken wire side. The other was crushed under a pile of chickens trying to get away from the owl. However, the owl never returned. He banged into the side of the tractor and left a pile of his own feathers on the ground. You may also find a bird laying on its back and looking purple. Heart attack. We had an americauna rooster die of a heart attack so it’s not just a CX thing. 4. Do they have feed? We always feed the broilers. I want to know if I fed them too much or not enough last time. I want to offer them too much feed…but only a little too much. Feed or not, I pull the feeders from the chicken tractors one at a time. Then I use the dolly to move each tractor forward, waiting on the chickens to move, being careful not to run over any birds. We find this goes better in the cool of the morning when the birds are hungry than in the evening when they are fat and the temperature is higher. The dolly was a trade for 8 chickens. He made it from sucker rod, angle iron and lawn mower wheels. The layer houses also need moved because they too make serious deposits on the ground. Feeders are filled and replaced, the water is filled again and we’re done for a couple of hours when we come back to feed and water again. The broilers need our attention about every four hours or so. If they go short on water they die. If they go short on feed they don’t grow the way we need them to. We can easily get away with checking the layers once/day when we gather the eggs. All it takes is excess feed and water capacity. But the broilers need our attention regularly. Consequently we’re shortening our broiler production windows. 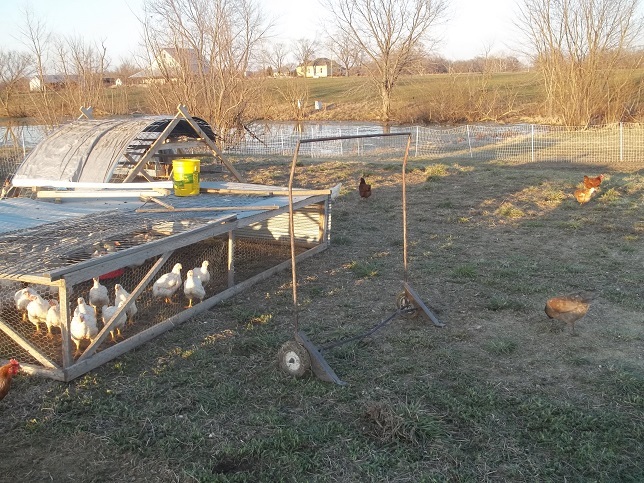 Keeping the two groups of birds together saves on time, reduces our fencing needs and limits waste from the broiler feeders. Any food that hits the ground gets picked up by the layers eventually. The chickens just aren’t paying attention to our butchering schedule. If you want a fresh, never frozen, hormone- and antibiotic-free, humanely-raised, pastured chicken you’re going to have to wait another week. If you want a frozen, hormone- and antibiotic-free, humanely-raised, pastured chicken you’re going to have to wait another week…cause we’re all out. Either way…we’re moving our processing date to the 20th. The pictures in this post are about a week old and are already out of date. This week we have highs in the 70’s and good chances for rain each evening. You can almost watch the grass grow right now. I am grazing my cows on remaining stockpile. Mostly though, I’m packing them into a small area and feeding them hay. I’m pushing carbon into the soil mostly on countour to the hill slope. Will it work? Well…it should. We’ll see. Maybe you’ll see the difference in the pasture over the next few years. Normally I start taking pictures as I leave the house. I’ll start todays’ walk by the horse barn instead. Last month I took a picture of a down locust tree in a sea of fescue nubbins. 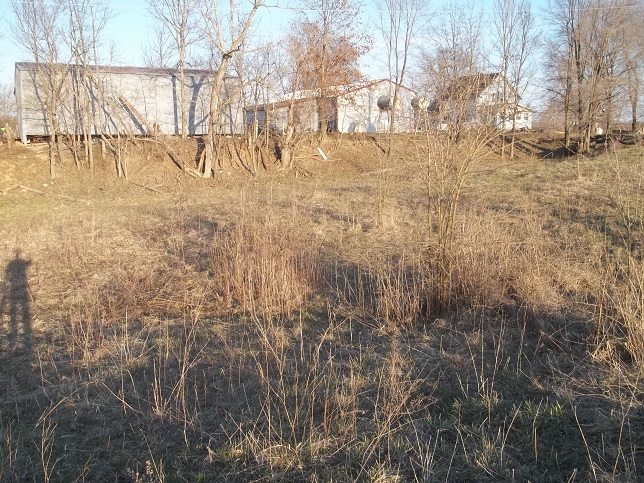 We burned the tree then overseeded with clover, orchardgrass, timothy and two kinds of rye grass and here’s what it looks like now (though the camera is pointed more to the right). The horses ate it down to the nubbins but it’s coming back well and it’s coming back with additional diversity. The real miracle here was that the horses showed me around 20 or so honey locust saplings. BTW, the picture above is almost the same shot as the one in this picture. I’ve cut a lot of hedge in the last year. There is a lot more to cut…and this is just one of my hedge forests. 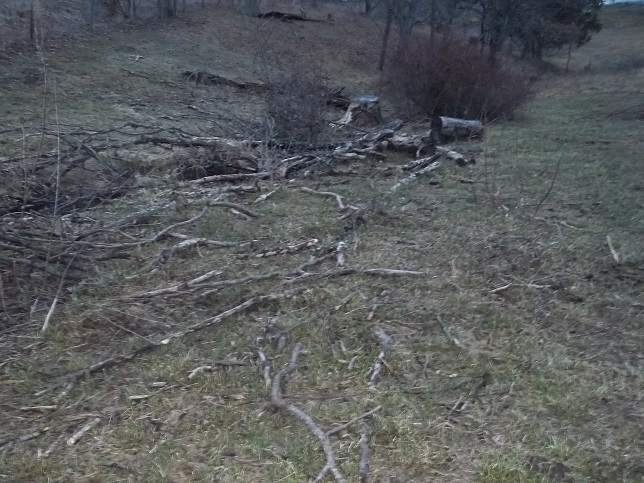 Many of the stumps are sprouting so I’ll have an ongoing supply of thorns and firewood in 5-10 years. Also, a pair of rabbits are living in the brush pile we built last year, though I only see them when I am out walking at night. The plan is to allow this to sit idle until July or so. Once the drought hits I’ll have a stockpile of grass for the cows to tromp and eat through. There are about 2 acres here. With luck, that will be just the bridge I need to allow my main pastures to recover fully. Then we’ll graze this again over the winter. Next year we’ll allow a different patch of land to go. This builds up carbon over time, allows ground-nesting birds to have a home and helps us keep our cows fat. The top of the hill was also grazed by the horses but not as intensively. It’s still a thick mass of fescue but was well pounded by running, playing horses and heavily manured. Good enough. But there are still clumps of moss growing on the North face of the hill. Where there is moss there is not grass. Where there are hooves there is no moss. I need more hooves…more pressure…to allow the grass to compete. On the topic of hedge, below the cemetery I cut out a single hedge tree that fell over and continued growing. 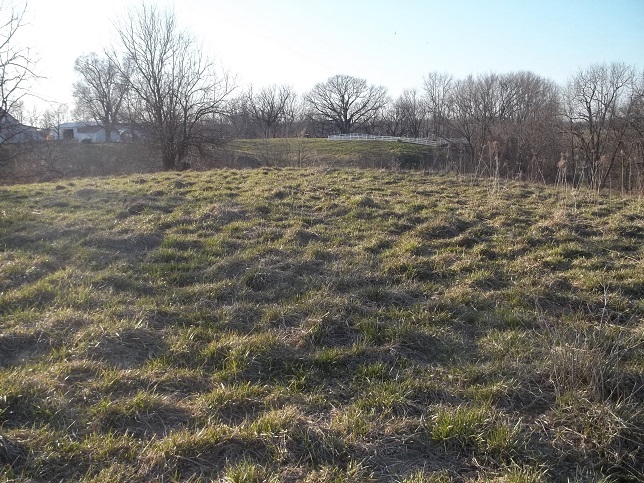 One tree, laying on its side, killing grass over a 40′ circle. This tree was the source of the pile of wood featured in a recent Facebook post. There is still an equal amount of wood waiting for me to cut now. 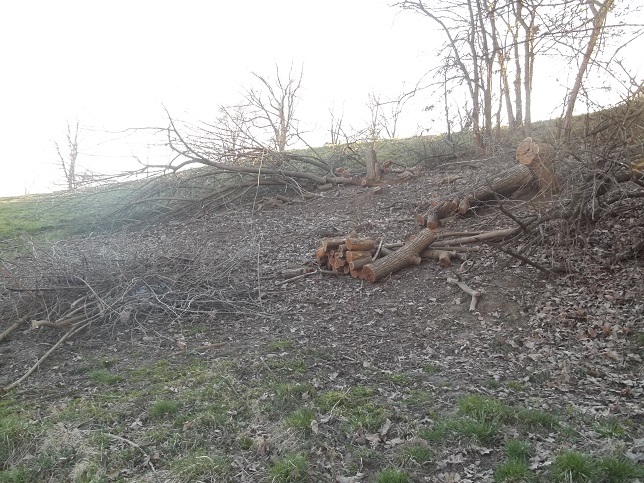 I have opened up more area for grazing and rid myself of a sick tree but cost myself small game habitat. That’s why I build brush piles. Quail and rabbits need shelter. If I won’t allow dead and dying trees to create that shelter naturally I have to do it myself. I also can’t continue cutting out undesirable trees without replacing them with something else or planning for their regrowth . More on that in a future post. There’s a little wedge of pasture West of our house by the road. When you come to our farm, this is what you see. Looks great, doesn’t it? I need to get a tractor in there to pull out the snags and rip out the sprouts but the whole thing is a thorny mess. Just like the bottom used to be. It’s an awful lot like work. I try to let the cows do as much of it as I can. 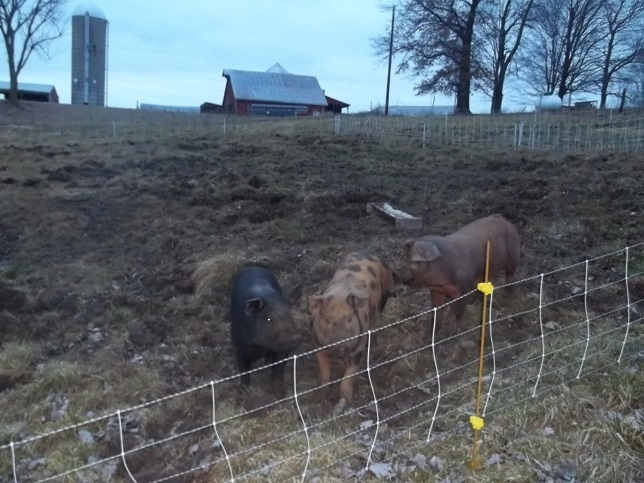 The pigs are in their final pasture position before shipping on Tuesday. You can see the kind of disturbance they create. That’s what we hire them to do. Right now I’m not grinding their feed. Among other things, they get cracked corn, roasted soybeans and whole oats. The oats are still whole when they come back out. 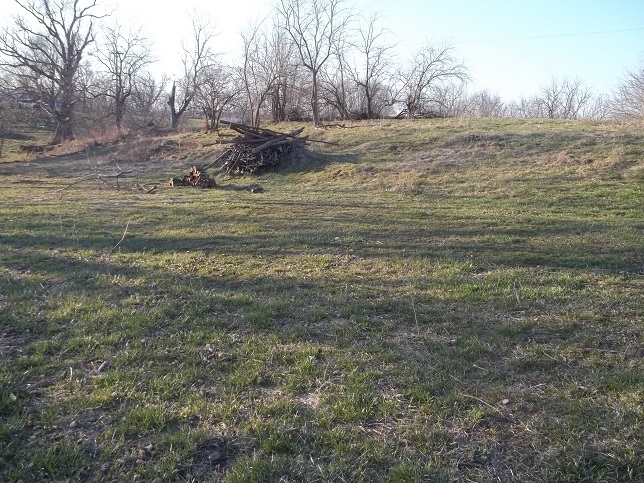 In a few weeks I’ll have a rich, strong stand of oats on my slope for the cows to graze through…thanks to the pigs plowing, manuring and seeding. The layer flock is in the same fence with the broilers on the alfalfa field. 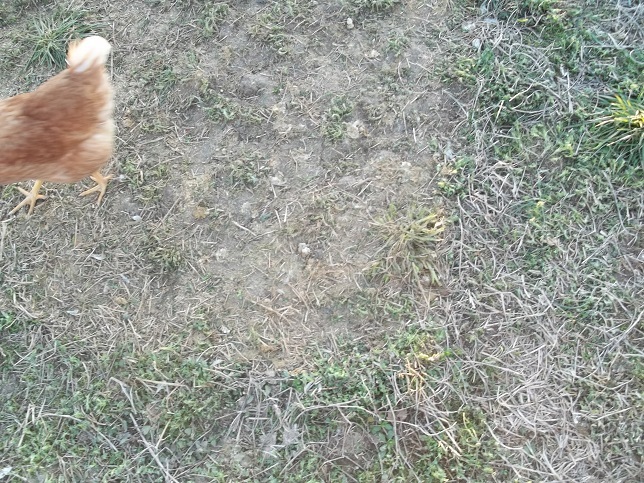 You can see an outline in the picture above showing where the chicken tractor had been moments before. The layers rush in to scratch through the manure and to gobble up any feed the broilers wasted. Both this and the neighbor’s alfalfa fields look purple right now from all the henbit blooms (and buzzing with bees). The hens bit the henbit here. None of it is left within the fenced area. The alfalfa is nibbled back but recovers quickly. Doing this may be risky in terms of the lifetime of the alfalfa stand but we not only get 4 cuttings of alfalfa here, we also get 500 chickens per acre and …I don’t even know how many dozen eggs, not to mention the fertility the birds put back into the soil. Am I hurting my alfalfa stand? I really don’t think so. Back to the cows. Molly is chewing here cud in the sunlight. Life is good. You can see the distant hillside still recovering from the pigs who were there until October or November. I see this less as a problem and more as a matter of time. 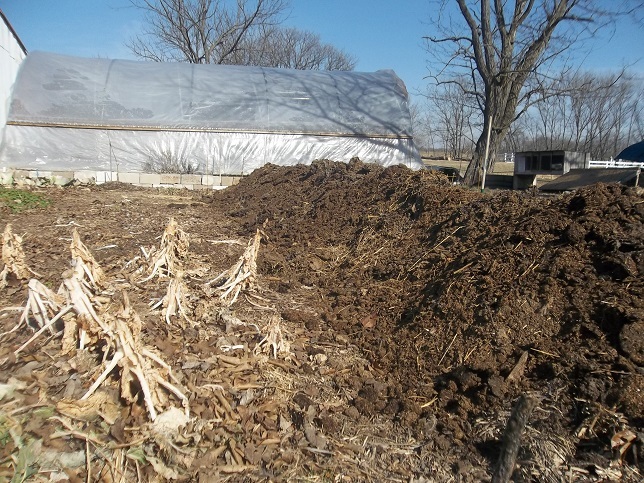 There is manure, carbon, seeds and living plant roots out there. With help from cow hooves I’m sure the scars will heal quickly. 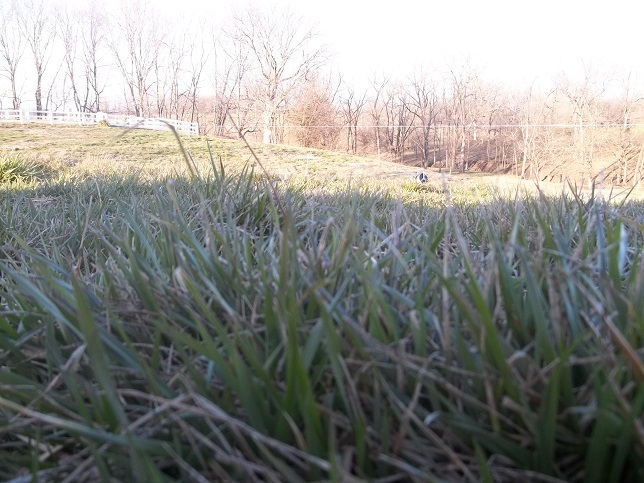 I present the grass in the foreground as evidence. Those same pigs were there in August. 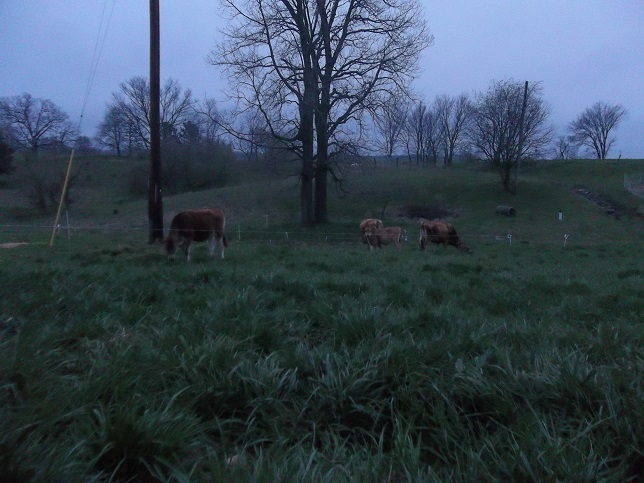 The cows aren’t scheduled to return to the cemetery hill until late May or even June. Mostly fescue but it’s growing. There is a fair amount of clover mixed in as well. We’ll get there. Well, not an instant garden. Took us about 4 hours. For the most part my rows are still defined from last year as several of them are still planted. 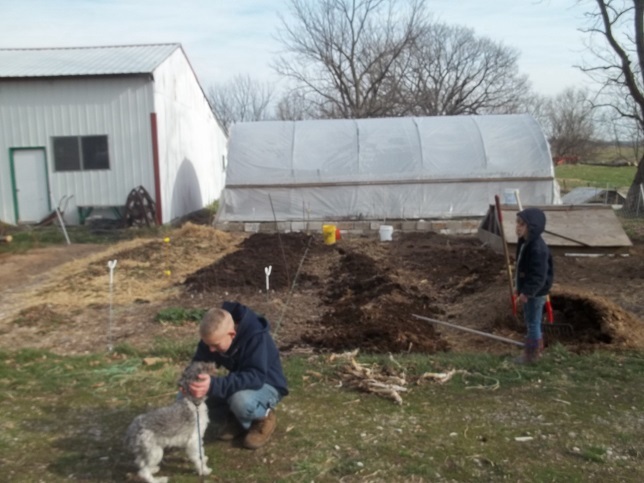 We put up strings to help guide us, pulled all remaining carrots, weeded the garden and fed the weeds and small carrots to the goats, then got down to brass tacks…er…horse manure. 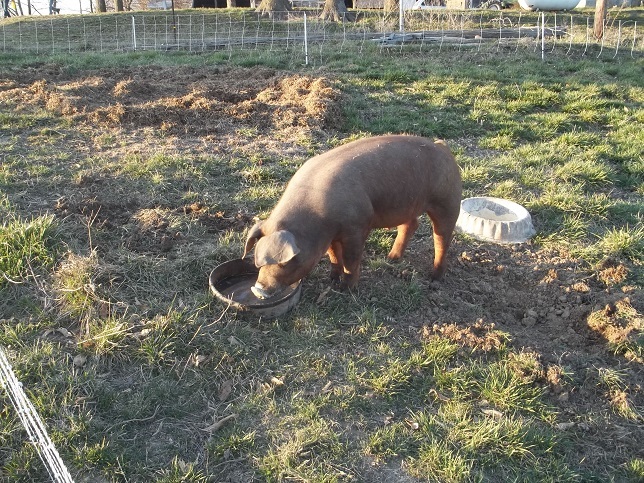 I spent the winter gathering horse, pig, rabbit and chicken manure…all mixed with sawdust and straw. We turned that pile a couple of times and watched the temperature vary. I don’t own a broadfork but I might make one. 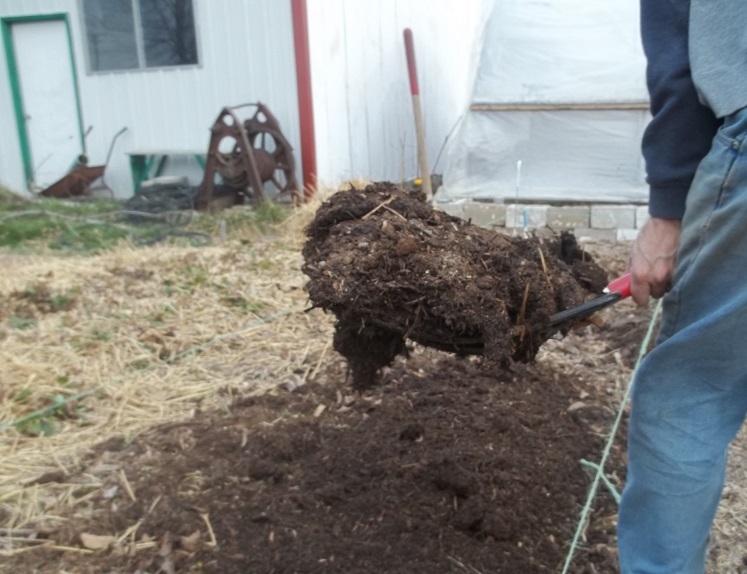 As a substitute I used my pitchfork to loosen the soil 12″ deep. I didn’t turn the soil, I just broke it up a bit. Then we began delivering manure one fork full at a time. One 12 year old, one 36 year old and a couple of pitchforks. The youngest two used rakes. Julie and the oldest daughter were at a hair appointment. Can you believe that? …until finally mom showed up and we let her do the rest. Mom took over planting onions, cabbage, brussels sprouts, broccoli and cauliflower and sent me off to find something else that was heavy and needed moving. Like the brooder. 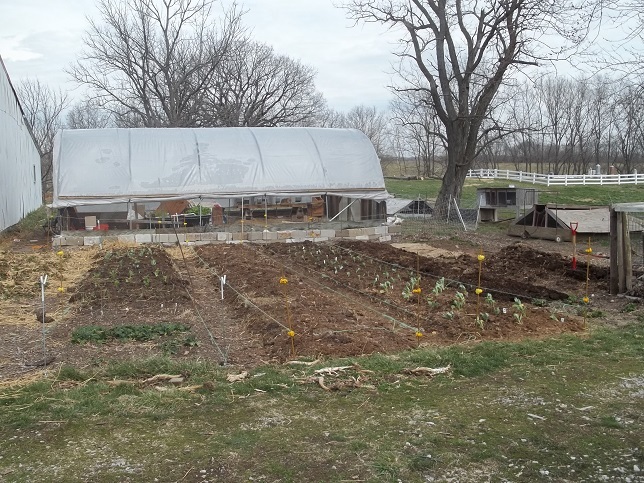 The center row is currently vacant but we’ll plant peas there tomorrow. The next row to the right is this year’s potato row so that’s on tomorrow’s list too. 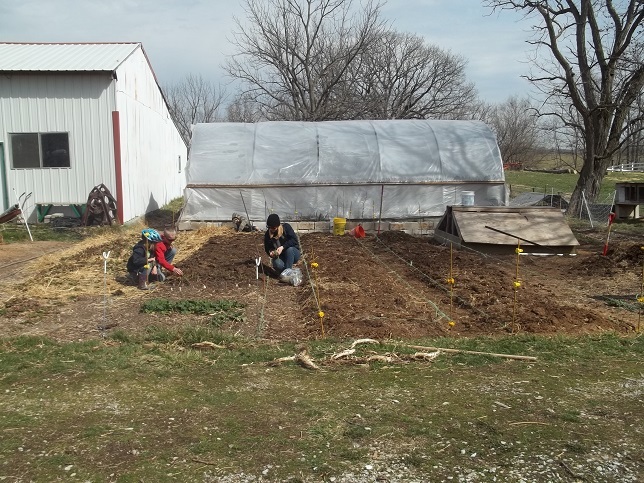 We also plan to plant tomatoes and peppers in the greenhouse tomorrow-ish. Once again, rows need to be cleaned out before we can start. Ugh. I’m very pleased with the amount of work we accomplished in a very short time. The garden is well established, we just have to maintain the fertility year by year. 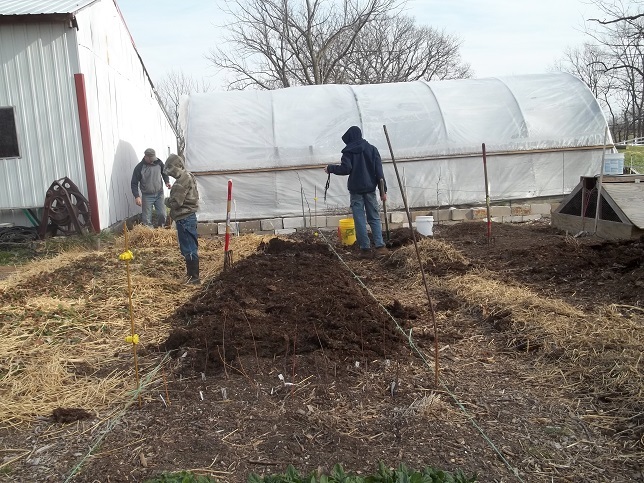 Everything needs a good covering of wood chips and we’ll coast through this growing season as we usually do…light weeding on Sundays, ignoring it otherwise. Just add water. These pictures were taken on March 11th though I was delayed in posting them. These pictures were taken early in the evening the day after a heavy rain storm. A sea of oxidizing fescue. 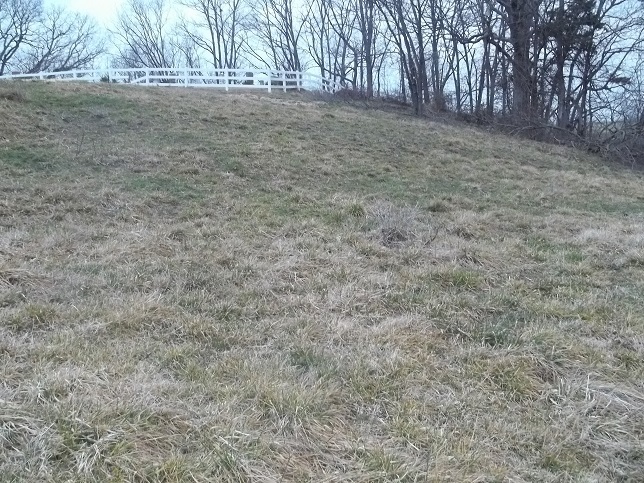 I mowed a small portion of this hill in December for sledding. I wish I hadn’t. The cows grazed the hill to the left in November and again in February. They won’t see it again till May. 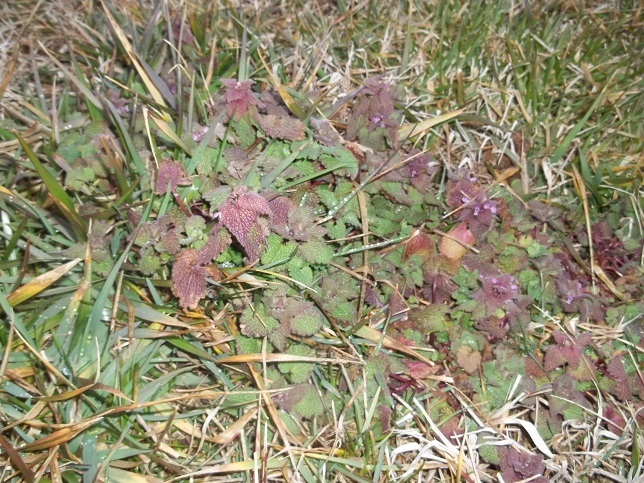 There are a few clumps of henbit emerging on the hillside. 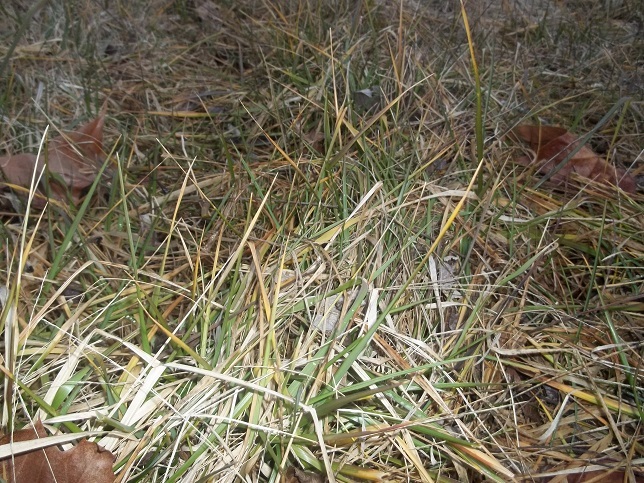 The grasses the cows prefer are starting to sprout away from the clumps of fescue. Not much else happening. 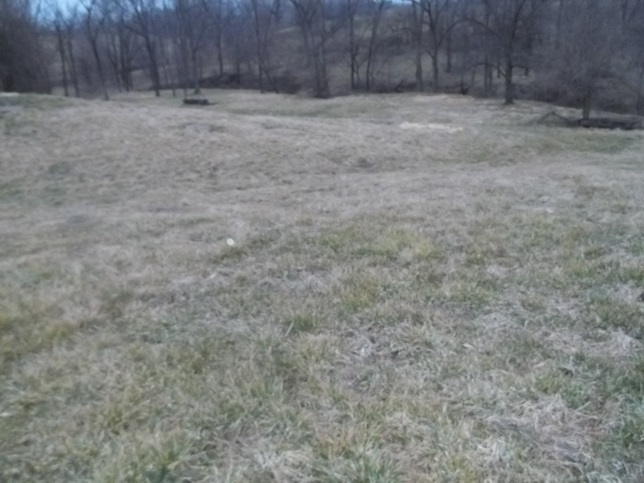 This is the primary sledding hill by the cemetery. The grass was pretty thin when we left the drought last Fall. 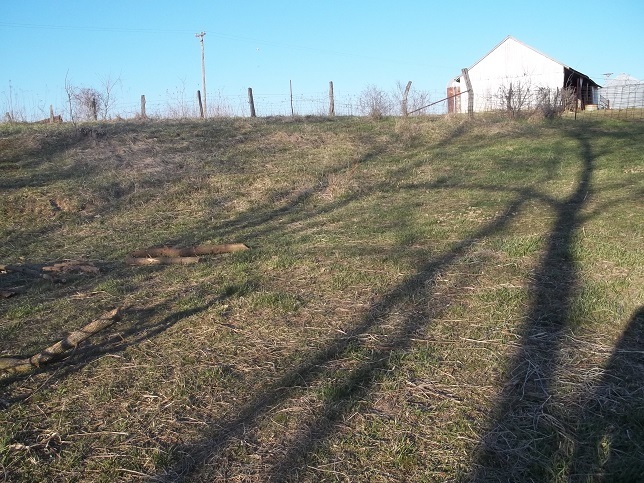 Pigweed stood in tall masses at the top of the hill, honey locust sprouts dotted the slope. It was pretty nasty. Hopefully we’ll use the cows correctly to push succession forward. 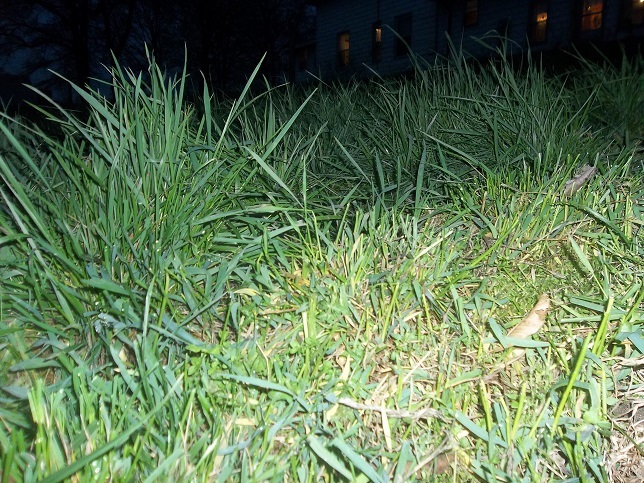 8-10″ tall fescue. The cows aren’t interested. 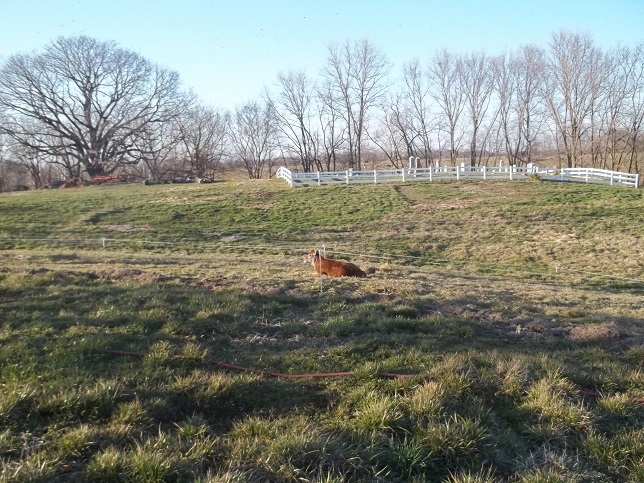 I invited dad’s horses to graze about 1/4th of an acre down to the nubbins. This area is always a thick carpet of fescue. The horses carpeted it with manure and pounded it with hooves. It was awesome! When they got to the bottom I could see a the bones of a honey locust I cut down a few years ago. 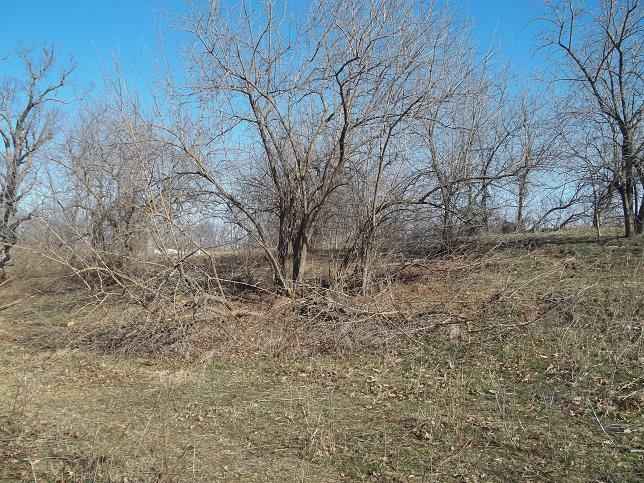 The tree (and most of its thorns) are now burned up and I have seeded the area with clovers and a variety of grasses. Wait till you see the recovery picture! Nearer to the house the pigs have really made a mess of the pasture. 3 pigs above 250 pounds have to be moved frequently. I want disturbance not destruction. Where they dig I kick the clods back into place and overseed with grasses and clovers. Please notice the pigs are clean and dry. Trust me when I say they are happy. They have room to run, work to do, fresh air to breathe, they can see the sun where most pigs are bored, confined, smelly and indoors. The pasture will heal quickly. The pork will be delicious. 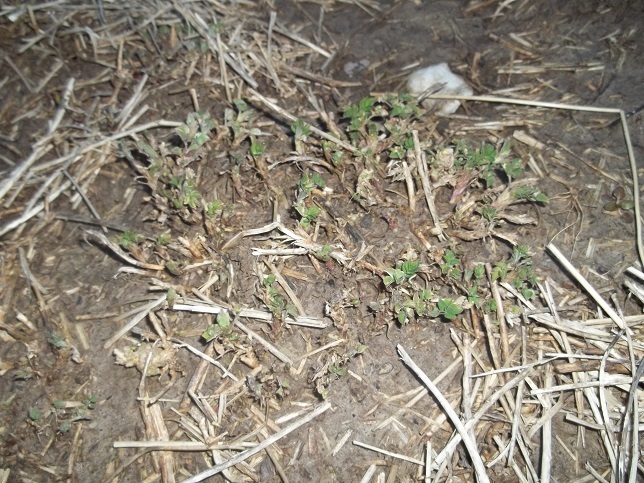 The alfalfa was just starting to emerge. I do some crazy stuff…some of it out of ignorance, some of it because I just don’t have the time to get everything done. I continued to move my layer flock across the dormant alfalfa field all winter. If that damaged the alfalfa I can’t see it. The emerging plant population does not appear to be diminished. That said, I don’t care for the empty spaces between the alfalfa plants. Nature will fill those spaces, probably with fescue. I think I should beat her to the punch. I’ll post my April stroll soon and will try to show the recovery that follows the pigs.